Affiliations: AIM, Bison, Blastaar & his troops, Condor, Gorilla-Man (Arthur Nagan), Hydra, somebody within Rand-Meachum Inc.
Powers/Abilities: He was able to open any lock with his occult powers. He was a master of hand-to-hand combat. (Marvel Comics Presents I#125/4 (fb) ) - Over the years of thievery Skeleton Ki got a reputation as a master thief from Samarkand to Sinkiang. He stole crowns off the heads of kings without their notice and swords out of the hands of hussars and highwaymen. (Marvel Comics Presents I#125/4 - BTS) - AIM hired him to steal the Anomaly from Rand-Meachum Inc. in New York. (Marvel Comics Presents I#125/4) - Skeleton Ki entered the high security section of Rand-Meachum Inc. without any problems. He attacked Tereshkova and her security team and took the pyramid the scientists called the Anomaly. The guards sent an alarm out and Skeleton Ki punished them for doing so. Iron Fist and Randy Oberlin tried to stop Skeleton Ki. He knocked Oberlin out after throwing the Anomaly into the air. He then put his cape on again and secreted the Anomaly within it. Iron Fist fought Skeleton Ki who was able to flee to the outside after opening a six inches thick steel and adamantium door with his powers. Outside the facility Skeleton Ki was knocked out by Iron Fist after agents of Hydra came down from the sky. They took the Anomaly and Skeleton Ki's cloak, but Iron Fist was able to get the Anomaly back from them. (Marvel Comics Presents I#126/4) - Skeleton Ki was taken into custody by Iron Fist. Tereshkova used a polymer to handcuff Skeleton Ki and built a cell consisting of the same polymer to imprison the thief. Skelton Ki gave no answers to Iron Fist's questions. Suddenly the ground began to shake and the cell of polymer crumbled. Skeleton Ki took the chance to break his handcuffs. AIM agents took him onboard and they attacked Iron Fist with their earthquake machine. Iron Fist jumped onto their aircraft and knocked it off balance. Skeleton Ki mocked Iron Fist when he fell from the aircraft and thought that he would die. Skeleton Ki got away with the AIM agents. (Guardians of the Galaxy II#9 (fb) - BTS) - Skeleton Ki was sent to Negative Zone Prison 42. (Guardians of the Galaxy II#9) - After the guards had abandoned the prison Ki became one of the prison's leaders fighting against King Blastaar's hordes. he worked on reactivating the portal to Earth again. When Star-Lord entered the prison he told Ki and the other leaders that activating the portal would allow Blastaar to invade Earth. Skeleton Ki, unlike Gorilla-Man, Bison and Condor, stayed quiet and opened the door for Blastaar's hordes after Jack Flag and Star-Lord were gone. (Guardians of the Galaxy II#10) - Ki approached Blastaar to inform him that he opened the doors for Blastaar's troops. In return Blastaar told his men that Ki was allowed to live. Later Ki was brought in front of Blastaar and asked to open the portal to Earth in Negative Zone Prison 42. Blastaar threatened Ki's life in case he failed to open it. (Heroic Age: Villains#1) - After Blastaar's forces were defeated by the Shadow Initiative Ki was returned to custody...this time at the Raft. Where did Skeleton Ki come from? As mentioned below he most likely learned his powers and martial arts in China. He mentioned the region of Sinkiang while bragging and it could've been there where he learned his powers. Does this make him a Chinese for sure? No! He also mentioned the city Samarkand in Uzbekistan. This is a city with a long history. It is one of the most important places for pilgrims of the Islamic society (I think the reason is the arm of King David which was stolen and brought to the city). The history of the city could be a reason why Skeleton Ki mentioned it or it could even be that he committed one of his most famous thefts there. His mentioning it by name could also mean that he was born there. Does this make him an Uzbek for sure? No! There are many other countries around the area he committed his crimes and he could've been from anywhere in those countries. There are no facts that would prove my former assumptions and so his citizenship stays as unknown. Skeleton Ki sounded like a boaster, but he could've been able to steal the stuff he claimed to steal from kings, hussars and highwaymen while they were sleeping. I just can't believe that he did it when they were awake because he wasn't a stealthy guy after he entered Rand-Meachum Inc.
Skeleton Ki is a nice wordplay. Ki sounds like key, but it is also the mental and physical state that exhibits in a psycho-physiological power known and taught in China (thanks to the Internet for this definition, but it is just one of many definitions). 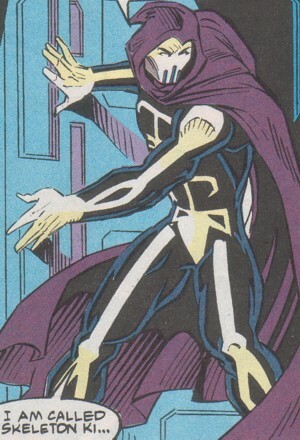 His power to open locks is probably bound to his mystical Ki (he mentioned that his ways were occult to Dr. Faro in Marvel Comics Presents I#125). Samarkand is a city in Uzbekistan (near the border to Tajikistan; Uzbekistan is above Afghanistan on the map) and Sinkiang is a region in China (at the border to Mongolia). It was never revealed who the traitor at Rand-Meachum Inc. was that gave information to Skeleton Ki and his clients. If Skeleton Ki really was from Uzbekistan I would point to Martina Tereshkova because Skeleton Ki could've been an old friend from the the time when both their home-countries were still part of the USSR. The traitor question could've been answered by the Contemplator, who knew the identity of the traitor, but he didn't reveal it to Iron Fist because he wanted him to leave Rand-Meachum Inc. and the part of his life connected to it behind. Skeleton Ki's real name and citizenship were revealed in his profile in OHotMU A-Z Update 2010#2. I think this story played at the time when Hydra and AIM were once again one organisation. Skeleton Crew, agents of Red Skull @ Captain America I#369? He was a scientist at Rand-Meachum Inc. and worked as main researcher on the Anomaly. He was sure that nobody could penetrate the area where the Anomaly was. He told his colleagues that the Anomaly felled an Oracle weather satellite and that its origins are unknown. Most things of the Anomaly were a mystery to Dr. Faro. When Iron Fist interrogated Skeleton Ki Faro assumed that Skeleton Ki didn't know anything about the Anomaly either. He was later shaken up by the attack of AIM. Faro was a smart scientist without any superhuman powers. 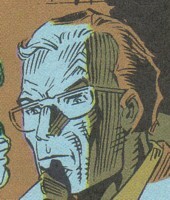 Dr. Faro was one of the people Iron Fist suspected of being a traitor within his company. Randy was the protege of Iron Fist. He was trained by Iron Fist in martial arts. He failed to stop Skeleton Ki and was knocked out by him with a cheap trick. He observed the imprisonment of Skeleton Ki and wanted to know what Martina used on Skeleton Ki. He was shaken up by the attack of AIM. Oberlin was a skilled athlete without superhuman powers. He was one of the people Iron Fist suspected of being a traitor within his company. Martina Tereshkova was the security director commander at the New York facility of Rand-Meachum Inc. She guarded together with her team the Anomaly. She was knocked out by Skeleton Ki when he attacked them and told Iron Fist that the thief was too fast to even shoot at him. She later built a cell of polymer around Skeleton Ki and also used it to on his hands to make sure that he couldn't use his powers. She closed the cell of polymer and was then shaken up by the attack of AIM. Her cell was destroyed and Skeleton Ki got away. 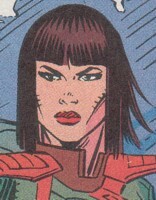 Martina was skilled in the use of weapons, but had no superhuman powers. She was one of the people Iron Fist suspected of being a traitor within his company.